No, the ingredients used to formulate PlantFusion have all been carefully chosen through our Select Source™ process to ensure authenticity. PlantFusion has been tested and confirmed non-GMO through the Non-GMO Project. All PlantFusion products are produced in a facility that has been certified as being compliant with all Good Manufacturing Practices (cGMPs) by NSF International, a world leader in third party audits and certifications, and the Natural Products Association. In addition, PlantFusion is certified as being Non-GMO through the Non-GMO Project and Gluten Free through the Gluten Free Certification Organization. ARE THE PLANTFUSION PRODUCTS ORGANIC? Many of the ingredients in our PlantFusion products are organic but in order to receive an organic certification; ninety-five percent of the ingredients must be organically certified. While we use only the finest quality, natural and wild harvested ingredients, the process to reach that threshold is already in process and should be attainable in the future. However, we do offer our Organic Fermented SuperFoods and Complete Organic Protein which are both fully USDA Organic. PlantFusion is formulated so that is has a Best Used By date of 24 months from the time of its manufacture; provided that it is in a closed container. A date code is printed at the bottom of the container to indicate the month and year (MM/YY) by when it is best used. For example, if the date code reads 06/15, that means that this product is best used before June of 2015. IS PLANTFUSION TESTED FOR HEAVY METALS? Yes, we do indeed do third party testing on all our PlantFusion products. There’s been a whole lot of attention lately on heavy metals in nutritional supplements. Particularly those products on the market containing brown rice and/or brown rice syrup. In the early development of PlantFusion, we found through our own research and testing that brown rice protein typically had levels of certain heavy metals (namely lead, arsenic and cadmium) that were many times higher than our other plant protein sources. Because of this, and a few other factors, we opted to take brown rice out of all of our formulas and continue to test for heavy metals within our products to ensure safety and efficacy. WHAT SWEETENERS DOES PLANTFUSION USE? ARE THEY NATURAL OR ARTIFICIAL? PlantFusion is now sugar free, as there are no added sugars within any product. We only use the finest and most natural sweeteners available in the world. Through our Flavor Pure™ process we have created the perfect balance of sweetness using Lucuma, Luo Han Guo, Yacon Root, and Stevia. Enzymes, Bromelain and Alpha-Galactosidase assist with digestion. Most legumes (like peas) contain starches that cause bloating and gas in many people. While these starches are naturally separated from the proteins in PlantFusion in its manufacturing processes, there still could be some trace amounts. Alpha-Galactosidase breaks down the remaining traces of starch to ensure easy digestion in even the most sensitive stomachs. Bromelain, a proteolytic enzyme from pineapple, helps to digest protein so the body can utilize it properly. Select Source™: PlantFusion’s unique process that evaluates hundreds of garden fresh ingredients from around the world including premium European ingredients and extracts that are manufactured to pharmaceutical standards. Flavor Pure™: PlantFusion has developed a method for blending specialty and natural wholefood ingredients that delivers amazing taste and texture. For example, we use ModCarb™ a patented blend of organic superstar grains, and hundreds of other patented ingredients that have been screened to the highest industry standards. Purity Promise™: PlantFusion is transparent with our product quality and manages every step of the process. Compared to most brands that use a third party to develop and manufacture their nutritional supplements, PlantFusion products are manufactured at our state-of-the-art USDA Organic certified facility in Edison, New Jersey. This ensures rigid ingredient selection, “open-book” manufacturing processes, and a world-class testing protocol managed by our own internal laboratory. All PlantFusion Complete products can be taken anytime, day or night. It can be used in the morning as a great way to start the day or after exercise to replenish and recover lost nutrients. Because of its high protein content it can also be used in between or before meals for appetite control or simply to maintain a steady stream of nutrients throughout the day. PlantFusion is made primarily from natural food sources similar to those you would find in a well - balanced diet. While negative interactions are unlikely; you should always consult with your doctor regarding questions about medications that you might be taking. If your doctor has inquires, they can contact our dedicated technical support line at 1-800-519-6266. IS IT SAFE FOR PEOPLE WITH DIABETICS, FOOD ALLERGIES, OR CRITICAL ILLNESS. CAN PLANTFUSION BE USED TOGETHER, OR WITH, OTHER MEDICINE OR SUPPLEMENTS? While negative interactions are unlikely due to the natural ingredients we use; you should always consult with your doctor regarding questions about medications that you might be taking. If your doctor has inquires, they can contact our dedicated technical support line at 1-800-519-6266. WHAT IS THE Ecolean™ PROTEIN THAT IS USED IN THE PLANTFUSION COMPLETE LEAN AMINO ACID INFUSED PROTEIN BLEND? Ecolean™ is a unique source of yellow pea protein found in the hills of northern France that shows unprecedented levels of protein, electrolytes, and key amino acids. It’s the only plant-protein with a clinical study to show that it curbs hunger 35% better than whey protein. ModCarb™ is a proprietary blend of six organic grains (Oat, Amaranth, Quinoa, Buckwheat, Millet, and Chia) which provide complex carbohydrates rich in beta-glucans. Unlike simple sugars or maltodextrin, ModCarb‘s complex carbohydrate structure allows it to release glucose (the body’s primary fuel source) at a much more natural pace and rhythm for sustained energy. This has the potential to minimize sudden cravings and/or energy dips during a typical daily routine. The technology used to create ModCarb™ won an International Food Technology award in 2013. Currently PlantFusion LEAN and PlantFusion Phood are the only two products you will find in premium natural specialty stores that contain this ingredient. WHAT IS ChromeMate® AND WHY IS IT ADDED TO COMPLETE LEAN? ChromeMate® is a unique, patented niacin-bound chromium complex. Clinical research shows that ChromeMate® is superior to every other form of chromium for blood sugar control, and maintaining healthy body weight. WHAT IS BANABA LEAF AND WHY IS IT ADDED TO COMPLETE LEAN? Banaba leaf is an extract of leaves from the tropical banaba tree. It has been used for thousands of years in India and the Philippines to naturally treat diabetes and low blood sugar levels. Corosolic acid, the active ingredient in banaba leaf, has been shown to inhibit carbohydrate digestion resulting in a reduction in blood sugar. In fact, some studies have shown that it can help lower blood sugar within sixty minutes. Erythritol is a naturally occurring sweetener found in small amounts in grapes, melons, and mushrooms. It has only 0.2 calories per gram which is 95% fewer calories than sugar. It does not affect blood sugar or insulin levels and has a glycemic index rating of zero. Erythritol is unique because it is metabolized differently than many other sugars because its molecular structure is much smaller. Due to its small molecular size, only 90% gets absorbed into the bloodstream while the rest is naturally eliminated. Because only 10% actually reaches the large intestine; erythritol doesn’t cause the gastric distress that is attributable to many other low caloric sugars. COMPLETE LEAN CONTAINS 9G OF FIBER PER SERVING. ISN'T THIS TOO MUCH FIBER? The fiber blend contains soluble fiber that can slow the absorption of sugar and help improve blood sugar levels. When blood sugar levels are controlled, it can tend to be more filling than low-fiber foods, so you're likely to have a maintained satiety. Soluble fiber absorbs excess liquid in the colon, preventing diarrhea by forming a thick gel and adding bulk as it passes intact through the stomach. WHEN AND HOW OFTEN SHOULD I TAKE COMPLETE LEAN? Based on the clinical study, it’s best to take Lean 30 minutes prior to meals, however, it can be taken anytime day or night for appetite control. It can also be used in the morning as a great way to start the day or after exercise to replenish and recover lost nutrients. HOW LONG CAN COMPLETE LEAN BE STORED? WHAT IS ITS BEST USED BY DATE? Lean is formulated so that is has a Best Used By date of 24 months from the time of its manufacture; provided that it is in a closed container. A date code is printed at the bottom of the container to indicate the month and year (MM/YY) by when it is best used. For example, if the date code reads 06/20, that means that this product is best used before June of 2020. HOW LONG CAN COMPLETE MEAL BE STORED? WHAT IS ITS BEST USED BY DATE? Meal is formulated so that is has a Best Used By date of 24 months from the time of its manufacture; provided that it is in a closed container. A date code is printed at the bottom of the container to indicate the month and year (MM/YR) by when it is best used. For example, if the date code reads 06/20, that means that this product is best used before June of 2020. HOW IS THE ERYTHRITOL IN COMPLETE MEAL MADE? Erythritol is made from simple mono-saccharides like xylose or ribose which are found in plants. These sugar rich substrates then go through a gentle enzymatic/fermentation process that produces a crystal which is 99.5% pure and without the negative health effects. ARE THE WHOLE FOOD VITAMINS/MINERALS IN COMPLETE MEAL "NATURAL SOURCE" OR SYNTHESIZED VIA FERMENTATION? The whole food vitamins/minerals in Meal are sourced naturally from organic Guava, Lemon, Sesbania (West Indian Pea), Amla (Indian Gooseberry), Holy Basil, and Annatto. These plants and fruits were specifically chosen because of their rich vitamin and mineral content. Together they supply not only a full spectrum of vitamins and minerals but all the naturally occurring constituents such as enzymes and phytonutrients that are present as well. Consequently no fermentation or synthesizing is required as is the case with chemically isolated USP type vitamins and minerals. The plants and fruits are simply dried, milled and analyzed to verify nutrient content. The plant material is then carefully proportioned to the level needed to make 1 kilogram of vitamin/mineral concentrate. For example, it takes 55 kilograms of the Amla plant just to provide the Vitamin C content for one kilogram of the vitamins/mineral blend used in Meal. WHAT IS THE SOURCE OF VITAMIN D3 IN COMPLETE MEAL? The source of vitamin D3 in Meal comes from Lichen, pronounced (lik-en). Lichen is a complex organism that is formed through the interaction of algae and a mushroom like organism in areas along the sea coast, desert and even the Arctic tundra. It is a natural vegan source of Vitamin D3. WHAT IS THE RATIO OF OMEGA 3/6/9 IN COMPLETE MEAL? The Land & Sea EFA blend in Phood contains EFA’s from three different plant sources which includes flax, algae, and sunflower. Delivered in this natural whole food state, the blend not only yields balanced levels of omega 3-6-9, but also valuable phytonutrients like lutein and zeaxanthin. It is then tested by gas chromatography to ensure that the total level of EFA’s in each serving of Meal meets or exceeds label claim. CAN YOU EXPLAIN THE ORGANIC FERMENTED SUPERFOOD BLEND? PlantFusion Organic is a complete protein blend with naturally occurring amino acids. The product has a total of 20 grams of protein. The organic fermented food portion of the formula consists of organic, sprouted lentil, millet, chia and flax. These ingredients are fermented with natural living starter cultures (the same ones used to create probiotics). During this proprietary fermentation process, many different strains of probiotics and enzymes are cultivated in their natural whole food state. When added to the concentrated plant proteins, this unique fermented blend actively breaks down the proteins into shorter peptides and amino acids for an easily digested and highly bioavailable nutrient source that is more efficiently utilized by the body. IS ORGANIC FERMENTED SUPERFOOD EASY ON THE STOMACH? WHY? Yes, PlantFusion Organic is easy on the stomach. It is the first protein shake specifically designed to enhance digestion. This is relative to the active cultures in our unique fermented food blend which helps to optimize the balance of flora in your digestive tract for better overall digestive health. The active cultures found in the organic fermented, sprouted food blend which has a broader range of beneficial bacteria to support digestion in a way that you can actually feel. PlantFusion Organic is also fortified with 100 mg blend of Bromelain and Alpha-Galactosidase, which provides added support for the digestion, absorption and bioavailability of all of the essential components. WHY IS THERE SEA SALT IN ORGANIC FERMENTED SUPERFOOD? WHERE IS THE SODIUM COMING FROM IN ORGANIC FERMENTED SUPERFOOD? The sodium in PlantFusion Organic is naturally occurring and comes from our proprietary blend of proteins, as well as a tiny amount coming from the added sea salt. It is approximately 11% of the daily value per serving. 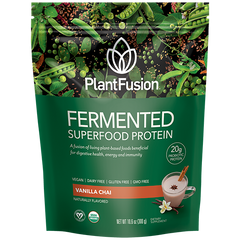 HOW DOES ORGANIC FERMENTED SUPERFOOD COMPARE TO ORIGINAL PLANTFUSION? Our new Organic represents major improvements over the original PlantFusion protein. The new version is USDA certified Organic and completely sugar free. It also has a fermented food blend that is specifically designed to maximize the digestion and absorption of the protein. No other protein shake, including our original PlantFusion, has this unique feature. WHY IS ORGANIC FERMENTED SUPERFOOD MORE EXPENSIVE? The new Fermented version is USDA certified Organic, sugar free, and contains a fermented food blend that is specifically designed to maximize the digestion and absorption of the protein. No other protein shake, including our original PlantFusion, has this unique feature. The added benefits, unique ingredients and organic standards all contribute to a slightly higher cost. 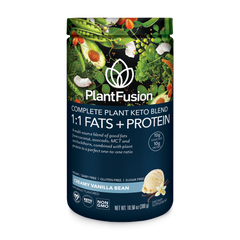 Although PlantFusion® Protein Ready-to-Drink is not considered a meal replacement, it was formulated to be the leanest plant-based protein than can be taken anytime day or night to help support nutrient intake. The ready-to-drink carton makes it easy to take with you wherever you are. WHY ARE MULTIVITAMINS AND MINERALS ADDED TO THE READY-TO-DRINK? We add a multivitamin and mineral blend to help balance any nutritional gaps in your diet. This blend provides you with approximately 20% of your recommended daily value. IS PLANTFUSION® COMPLETE PROTEIN READY-TO-DRINK HIGH IN SUGAR? PlantFusion® Protein Ready-to-Drink has just 6 grams of sugar per serving and has the lowest carbohydrate or sugar content of any non-dairy protein shake on the market. At only 6 grams of sugar per serving, it has a very low and favorable glycemic index rating. The sweetness in our PlantFusion® Protein Ready-to-Drink is derived from a combination of Stevia, organic evaporated cane sugar and non-GMO crystalline fructose. Stevia is a natural, non-caloric sweetener made from the leaves of a South American plant. Our organic evaporated cane sugar is the unrefined remains of sap extracted from sugar cane. By not being refined, it retains more nutrients than other forms of sugar. The Fructose is crystalline fructose, which is 98% pure fructose (the other 2% is naturally occurring water and minerals). Crystalline fructose is very different than high fructose corn syrup, which is 55% fructose, the rest being glucose. Therefore, crystalline fructose is digested more slowly and has a much lower glycemic index than that of regular granulated sugar or high fructose corn syrup. WHAT IS THE BEST USED BY DATE? HOW LONG CAN PLANTFUSION® PROTEIN READY-TO-DRINK BE STORED ONCE OPENED? PlantFusion® Protein Ready-to-Drink is formulated so that is has a Best Used By date of 12 months from the time of its manufacture; provided that it is in a closed carton. Best Used By is simply an indicator of freshness. A date code is printed on the container to indicate the day, month and year (DDMMMYYYY) by when it is best used. For example, if the date code reads 25 MAY 2019, that means that this product is best used before May 25th, 2018. PlantFusion® Protein Ready-to-Drink does not have to be refrigerated although it is suggested to be served cold. Once open, it should be refrigerated and consumed within 72 hours. PlantFusion® Protein Ready-to-Drink is packaged in a TetraPak® carton which is recyclable.